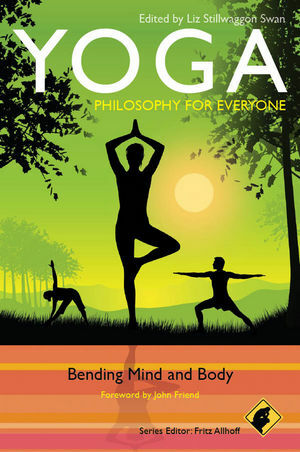 Yoga — Philosophy for Everyone presents a wide array of perspectives by people whose lives have been touched by yoga. Addressing myriad aspects of yoga's divergent paths, topics include body image for men and women; the religious and spiritual aspects of yoga; and issues relating to ethics, personal growth, and the teaching of yoga. Written by philosophers and non-philosophers alike, with contributions from professional yoga instructors, lifelong practitioners, and first-timers, Yoga — Philosophy for Everyone offers a wealth of material for both enjoyment and deep reflection. Liz Stillwaggon Swan has a PhD in philosophy and is a certified yoga instructor. Her niche in the world is helping people exercise their brains and their bodies. Her recent publications in the emerging field of biosemiotics explore how we use our brains and bodies to make sense of the world. She is also a new mother and delights in watching her son practice happy baby pose. Fritz Allhoff is an associate professor in the philosophy department at Western Michigan University, as well as a senior research fellow at the Australian National University's Centre for Applied Philosophy and Public Ethics. In addition to editing the Philosophy for Everyone series, he is also the volume editor or co-editor for several titles, including Wine & Philosophy (Wiley-Blackwell, 2007), Whiskey & Philosophy (with Marcus P. Adams, Wiley, 2009), and Food & Philosophy (with Dave Monroe, Wiley-Blackwell, 2007). His academic research interests engage various facets of applied ethics, ethical theory, and the history and philosophy of science. Notes on Contributors 212 ?